I'll be perfectly honest - I struggled with Our Lady of the Inferno at the outset. As intrigued as I was by the story, and as much as I wanted to get to know the characters, the narrative style was very off-putting. Lots of long, rambling paragraphs, with too many thoughts strung together, and too little punctuation. It was jarring, but I suspect that was exactly what Preston Fassel was going for. This is not a book designed for a comfortable read, but one that wants you to be as unsettled as its characters. 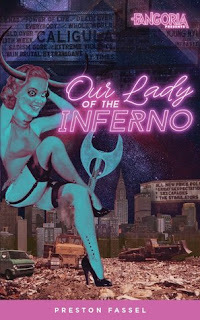 A dark, gritty thriller with moments of brutal horror, Our Lady of the Inferno is a throwback novel with a conscience. It's as much a story about the relationships between women, the obligations between sisters of spirit and flesh, as it is about the horrors they face. It's the story of a woman by the name of Ginny - a sister, a recruiter, a teacher, a protector, and a fighter. A victim of circumstance, perhaps . . . a victim of her own sense of obligation, for sure . . . but never merely a victim. She does horrible things because she has to, and wonderful things because she wants to. Ginny is deeply flawed, damaged in so many ways, and yet hers is still a story of seeking redemption, and that is what keeps the rest of the novel on track, and on pace. Intersecting her story is that of Nicolette, a woman who holds up a cracked, jagged sort of mirror to Ginny. Both are seasoned professionals in their fields, women to whom others look up to, but where Ginny embraces her sisters, defines herself by her bonds, Nicolette is an antisocial loner for whom people are faces without names, who defines herself by escaping the risk of such bonds. Where Ginny is a natural, if reluctant, leader of the women around her, Nicolette is a dangerous, aggressive sort of leader, a woman who sees herself as a monster worthy of tribute and sacrifice. In a world where we expect men to be the predators, it is a woman who poses the greatest danger to Ginny and her sisters . . . and yet, the monster is somehow the more sympathetic of the two. Fassel writes a slow-burning tale, one that creeps inexorably closer to an eventual confrontation. He draws us into the lives of these women, back into the era of excess, and deep into the street culture of Times Square. He makes us care for the women, making us feel every ounce of grit, dirt, and blood. By the time the climax comes, it's almost a relief, and that makes it even more powerful.